Deepdale Christmas Market takes place on Friday 4th, Saturday 5th and Sunday 6th December at Dalegate Market in Burnham Deepdale – The official start to the festive season on the North Norfolk Coast. This year Deepdale Christmas Market will welcome over 100 local producers and artisans in large marquees around the Dalegate Market site and in St Mary’s Church. They’ll join the permanent shops of Dalegate Market, Deepdale Café and be joined by great street food, entertainment and charity stalls. The organisers of Deepdale Christmas Market like to mix the old favourites with new choices each year, keeping the mix of stalls fresh. So you’ll find Lymn Bank Farm Cheese Co in their usual place outside One Stop Nature Shop, James Buttifant and his penguins in the Dalegate Tent, Pebbles Photography in the Walkway Tent and Bringing The Outside In in the Orchard Tent. New additions include BON Bakery, Jolly Smokehouse, Cushion Cottage, Gourmet Brownie, Lilac Nurseries, Happy Hats, Samuel Thomas Art and Polly Baker Textiles, to name but a few. “The jigsaw of stalls gets harder each year, as application numbers and the quality of those applications increase. We look for a broad mix of artisans and local producers, to give visitors a varied interesting mix. I’m personally looking forward to the Winbirri Norfolk Wine, and the eclectic characters from Asta Potteries. However I know certain members of my family will be more interested in some of Dale’s lovely chocolate from The Chocolate Deli and Pixie Hall’s delicious handmade truffles.” said Jason Borthwick, one of the organisers. Now in its 7th year, Deepdale Christmas Market has been developing year on year. The biggest change for 2015, is the addition of Friday afternoon and evening, with the Market opening its doors at 2pm on Friday, with late night shopping until 8pm. The Market will then be open from 10am to 4pm on both Saturday and Sunday. There is also a new layout for the Walkway Tent, relieving the pressure along the walkway by The Hare & The Hen and offering more undercover stalls for visitors to enjoy. “Friday afternoon and evening was suggested to us by the stall holders, and we’re really pleased with how popular the idea is. Many people have said they are excited to visit for the first time this year, because they have to work at the weekend and haven’t managed to visit in previous years. I’m looking forward to listening to Addison’s Uncle on Friday evening, as Jason and his family are big fans.” said Estelle Townshend, another of the organisers. 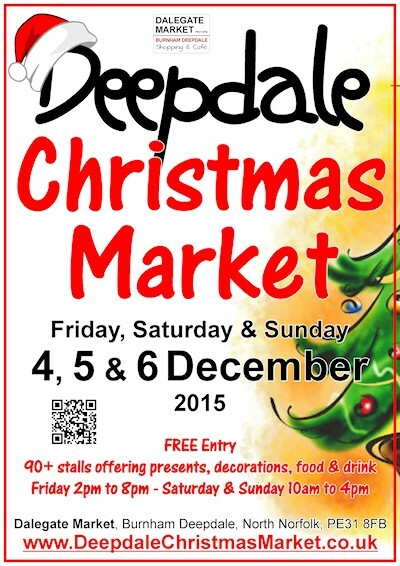 As usual, its FREE Entry to the Deepdale Christmas Market. There’s also FREE Car Parking in the Deepdale Farm yard and on a couple of grass fields, just follow the signs in Burnham Deepdale. The Coasthopper bus service stops right on the doorstep, connecting with villages and towns along the coast and train services at King’s Lynn and Sheringham.